The Colombian military has held its first meeting with Farc rebel leaders at peace talks in Havana. Their talks will focus on ways of implementing a ceasefire and, if a peace deal is agreed, on the laying down of weapons by the rebels. President Juan Manuel Santos said the government and rebels were getting closer to an agreement. Earlier this week the rebels met, also for the first time, a group of victims of the five-decade war. "It is undoubtedly important that active-duty members of the armed forces and the Farc have sat at the table under equal conditions," said the head of the rebel delegation, Ivan Marquez. Leading the military is Gen Javier Florez, the head of Colombia's joint chiefs of staff. Gen Florez has taken part in some of the army's most successful operations against the Farc, including the operation that ended the life of the Farc's former military chief Jorge Briceno, in September 2010. 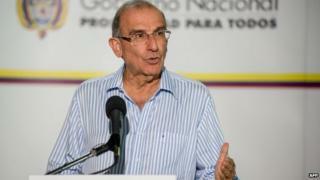 The head of the government negotiating team, Humberto de la Calle, said the military had formed a subcommittee that would prepare future mechanisms for a ceasefire that would only enter into force once a final agreement was reached. "I repeat, so it is absolutely clear, at the moment no-one is negotiating a ceasefire," he said. Negotiations between the government and the Farc were launched in the Cuban capital, Havana, in 2012. The talks are aimed at getting the Farc to sign an agreement renouncing its armed struggle in order to join the legal political process. The current round of talks ended on Friday and will resume in September.